Sometimes, the best retirement stocks are the ones you've already heard of. Retirees need strong, stable investments that will generate income for years to come. 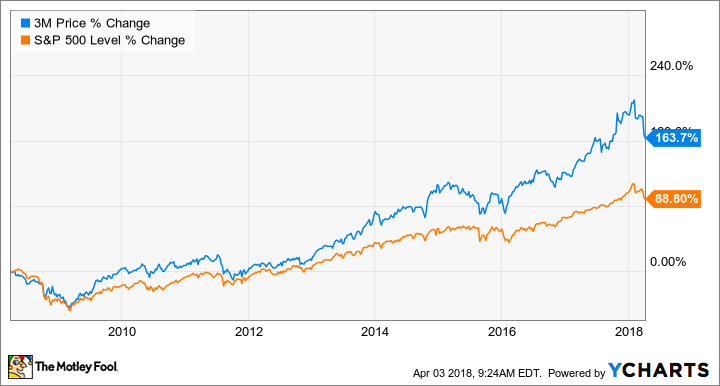 Most of the time, this means that the best dividend stocks for retirees are companies that you've already heard of and have long and proven histories. We asked a handful of Motley Fool writers for their top dividend stocks for retirees, and they came back with Verizon Wireless (NYSE:VZ), McDonald's Corporation (NYSE:MCD), and 3M (NYSE:MMM). All of these companies have strong dividends and could make great additions to your retirement portfolio. Nicholas Rossolillo (Verizon Communications): For many retired investors, the metrics for finding dividend-paying stocks consist of high dividend yields and the perceived stability of the company. While those are undoubtedly important, it's equally important to look at a company's plan for future growth. Verizon meets all criteria. Verizon's bread and butter is its wireless business. Known for its "best network" ad campaign during the last few years, the company gave investors a little scare early in 2017 when it reported the first decline in its subscriber base in years. Verizon made some adjustments, though -- chief among them offering "unlimited" data usage like its smaller rivals -- and by year-end, its retail subscriber base had grown by 2.1 million over 2016. The corporate tax cuts enacted late in 2017 further bolstered Verizon's lead. The company's management said it realized a one-time benefit of $16.8 billion and that quarterly free cash flow will increase at least 50% because of its newly reduced tax rate. All of that equates to a dividend currently yielding 5%. As for the future, Verizon is funneling money into new lines of business to fend off competitors. It has a media division called Oath that consists of Yahoo! and AOL and a small Internet of Things business that's been growing by about 20% year over year. Most exciting, though, is its next-generation 5G network that will begin initial rollout in select cities later this year. 5G is more than just faster speeds for smartphones -- it's being designed as the backbone for future technologies like autonomous vehicles, connected healthcare, and everywhere-accessible cloud computing. Rich Duprey (McDonald's): Burgers and breakfast get discussed a lot when talking about McDonald's, but what about it's dividend? Not so much. Yet it should because the burger eatery has been a consistent dividend payer for decades and has increased the payout every year for almost just as long. In fact, McDonald's has hiked the dividend for 42 consecutive years, most recently last November. The payout currently yields 2.6%. That's the sort of consistency retirees should look for when choosing a stock for their portfolios. They know the company's track record suggests it has a management team that's reliably looking toward the future and will continue to carefully control its resources going forward. McDonald's has been a good steward for shareholders. It's had its share of ups and downs over the years as dining trends have come into and gone out of fashion, but the burger joint is focused once again on ensuring its customers get what they come to the Golden Arches for: a good, tasty meal at an affordable price. Management has on occasion run off the rails trying to chase fads, such as pursuing millennials who sought out upscale burger shops. But McDonald's isn't Shake Shack and its customers aren't looking for what's trendy. Last year, it finally got back to basics and began investing heavily in its dollar menu again. This paid off with higher comparable sales and customer traffic, something that's been lacking from its results for years. Now that McDonald's is focusing again on what its customers want, investors, including retirees, can take a seat at the table of this basic dining stock. Chris Neiger (3M): Not many companies can claim that they've paid a dividend to their investors for more than a century or that they've raised it for 60 consecutive years, but 3M is one that can. The company currently pays a forward annual yield of 2.44%. What you get with 3M, however, is more than just a stable yield -- the company's shares also consistently have outpaced the market. Here's a look at the company's share-price performance over the past 10 years. 3M makes a laundry list of industrial products that range from adhesives to display films for tech devices, as well as its popular consumer products like Scotch tape and Post-it notes. All in all, the company has about 60,000 products and its strength comes from its commitment to reinvesting its revenue to create new ones. That's why it's important to note that the company invests about 6% of its sales into its research and development division on an ongoing basis. The company's sales were up 9% in the fourth quarter of 2017, to $8 billion, and its operating margin was at a very healthy 22.8%. Its net income slid in the quarter, but that was from a one-time tax event due to the recent tax reform. If you back out the expense, earnings per share climbed 11.7% year over year. 3M's business is built around the idea of making great products that will fuel stable sales and earnings for years to come -- which is exactly what retirees should be looking for. There are flashier companies out there, but it doesn't get much better than 3M when it comes to the ideal dividend play.